The KØXM Portable Allstar Network repeater is complete! Chuck - KØXM & I put the finnishing touches to it this evening. ( in the orange case of course....) :) with a load of Arch Linux and Asterisk APP_RPT software. I hope Chuck get a lots of use while in San Diego. It will let him pass some of his down time with us back here in KC while being on the road. The repeater was built in true Back Yard Style - mostly outside and with lots of recyled parts and pieces. 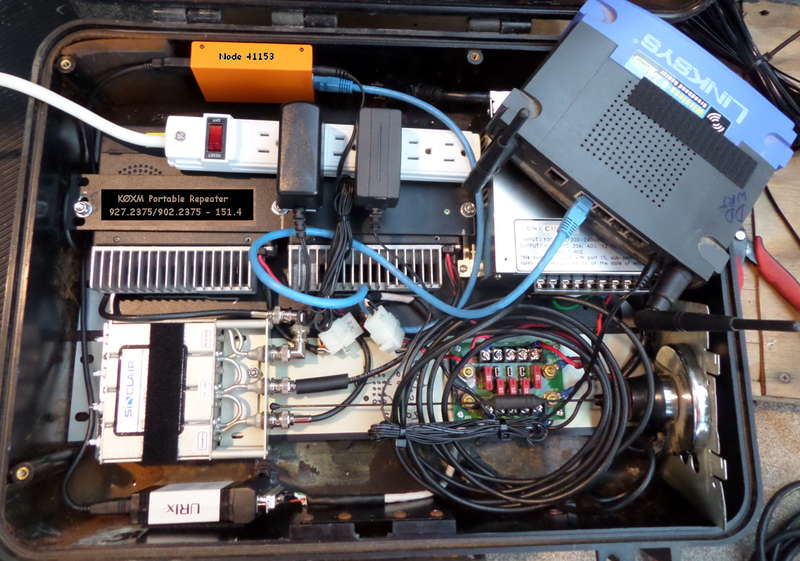 While not very pretty it is a fully functional full duplex low power repeater. 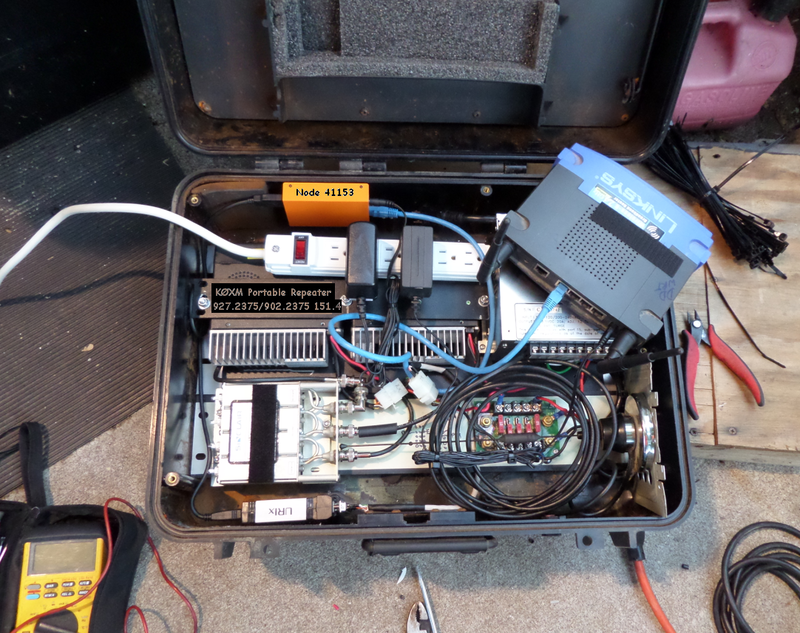 1 - Pelican case of unknown origin, was given to us at the Warrensburg hamfest this year. All the mounting hardware was out of the well stocked junque box at home and at work. August 2014 - Some New 900 Mhz Fun and Games! Sorry for not posting in awhile. I been rather busy this summer with all kinds of projects and such. Chuck - KØXM & I have been doing lots of things at some of our repeater sites here in the metro. We have finally got network installed at the Foxridge site so we can hook the 927.5875 quantar and the UHF 442.100 repeater to our asterisk network. Anyhow found out a few days ago Chuck, KØXM will be making a trip to 6 land later this month so he needs a portable repeater to keep in touch back home here in Ø land while he is there. Hence this post..... here is the start of the project. The pictures are in no particular order at this time will format them later today and write a description as we move along. The controller will be a DMK Engineering URI and a Beagle Bone Black ( in and orange case of course....) :) with a load of Arch Linux and Asterisk APP_RPT software.